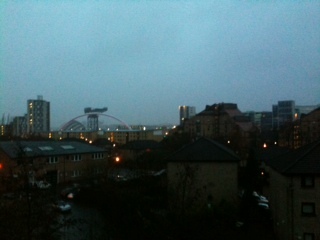 Saturday morning… it was dark, overcast and raining when I got up and got my running stuff on. I met Julie Ann at Bellahouston just after 9am and ran just over 5.5 miles out through Pollock Park and along the White Cart Water near Ross Hall towards Paisley – and back. It was raining for most of the run and we had to run through puddles and dodge the really deep ones. We had some good chat and got to know each other and what keeps us going and what ticks us off. Julie Ann is a good runner and a nice woman, I’m sure we’ll get along just fine. The route was nice, through Pollock Park off the main road, then along quiet roads and along the river. Nice and pleasant and undulating. At the half way point we took a SIS caffeine gel…and I drank a bottle and a half of lite lucozade when I got back to the car. I think I’ll take my water pack with me for the next long runs (above 11 miles). 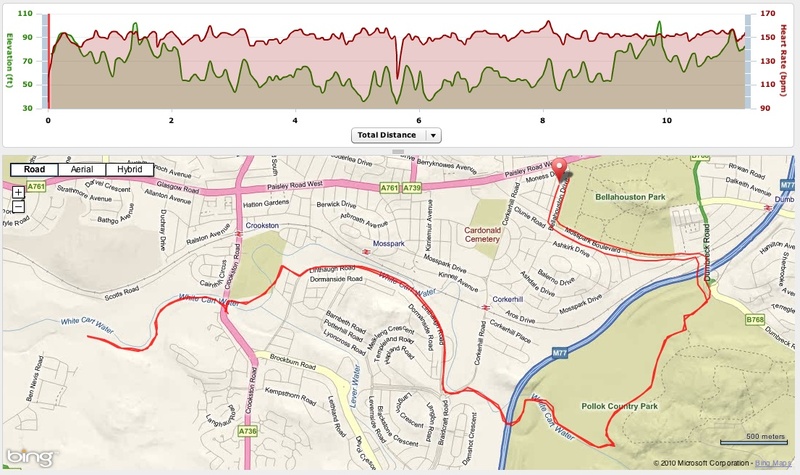 A nice comfortable pace with good chat and a nice route. I need to remember it’s a marathon I’m training for and not a race… so the pace today was just right. And hour after the run and my left eye has gone blurry… even when I put my glasses on… mmmm. But this morning I got my period… first day is always the worst with pain. I was worried it might affect my training – and worst of all my first day might land on the day of the marathon…. but I’ve checked and I THINK… based on today and my usual cycle… I should get my period on the 12th of April – 2 days after the marathon. Fingers crossed. Today the pain wasn’t bad when I was running anyway…. I have a feeling it might be later… but nevermind. I’ll keep an eye on it over the next few months and if there’s a chance the first day lands on the day of the marathon I’ll go to the docs and see about going on the pill to allow me to change my cycle! Great fun! Run: 11.27M, 1:41:52, Pace: 9:02 min miles (6.6 mph), Calories: 1,203. Ave HR: 151 (79%), Max HR: 164 (68%). Hydration/Energy: SIS caffeine gel during, 1.5 bottles of lucozade lite & 500mls of water after, Protein and Carb Lucozade Recovery Bar after. 340 mile challenge: 26.2 miles completed, 313.7 to go. (1.95M ahead of target). This entry was posted in Run and tagged 11.27, 9 min miles, bellahouston, caffeine, comfortable, energy gels, hydration, julie ann, long, marathon, miles, park, pollock park, puddles, rain, run, steady, training, wet, wet feet. Bookmark the permalink.